We are a leading Manufacturer of vintage salad servers, wooden salad servers, antique salad servers, sterling salad servers, mother of peal salad spoon and stainless steel sale spoons from Moradabad, India. Our organization is counted among the leading manufacturers and exporters of superior quality Vintage Salad Servers. Our professionals manufacture these servers using finest quality metals that are obtained from well established vendors. To bring best quality products our professionals design these servers in adherence with the latest market trends. Offered servers are widely demanded in restaurants, food marts, canteens and hotels. 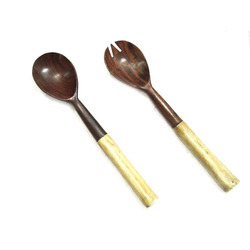 We are leading manufacturer and exporter of superior quality Wooden Salad Servers. 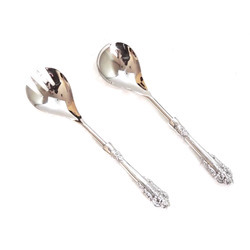 We are leading manufacturer and exporter of superior quality Antique Salad Servers. We are among the leading manufacturers and exporters of high quality Sterling Salad Servers. These servers are precisely manufactured by our experience workforce in adherence with the latest market trends. Offered servers are widely appreciated among our clients for their attractive design, perfect finish and light weight. Our servers are highly resistant to heat and corrosion and find their application in domestic kitchens, restaurants, food courts and departmental canteens. We are offering exclusive quality Mother of Peal Salad Spoon at competitive market price. 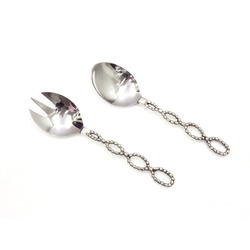 Known for their user friendly features, these spoons are manufactured under strict supervision of our team of experts. Offered spoons are widely demanded among the clients for their elegant designs, mirror-shine look and anti-corrosion property. We hold the expertise in manufacturing and exporting superior quality Stainless Steel Sale Spoons. Offered spoons are exclusively demanded in their various application areas like domestic kitchens, restaurants and hotels. 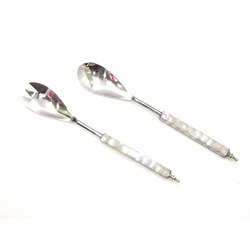 In the manufacturing of these spoons our professionals use high quality stainless steel. 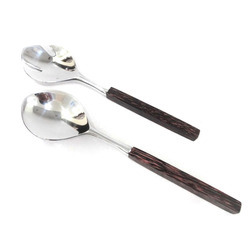 Offered spoons are widely appreciated by our clients for their fine finish and long lasting sheen.